David E. Shipley joined the University of Georgia School of Law faculty as dean and professor of law in July 1998. He led the school through the completion of a strategic planning process, a $3.2 million renovation of several classrooms and the law library's Carl E. Sanders Reading Room, a school-wide technology upgrade, the creation of the director of advocacy position, the establishment of a new clinic and the successful passage of an American Bar Association site inspection. Also, under his leadership, there was a steady improvement of incoming student credentials. He resigned as dean in June 2003 to resume teaching full time. In 2012, he was awarded the Georgia Athletic Association Professorship in Law. Shipley has been teaching courses on civil procedure, copyright, administrative law and remedies since returning to the classroom. He also helped establish the law school's semester abroad program at England's historic Oxford University. This program was in operation from 2006 to 2016, and Shipley served as the program's professor in residence at Oxford in 2007, teaching international intellectual property and comparative administrative law to 20 law students. In 2010, he was named the UGA Faculty Athletics Representative to the NCAA and the Southeastern Conference (SEC). His responsibilities include working with the Athletic Association to support the academic progress and success of UGA's student-athletes, serving as secretary to the Athletic Association's board of directors and helping monitor compliance with NCAA rules and regulations. 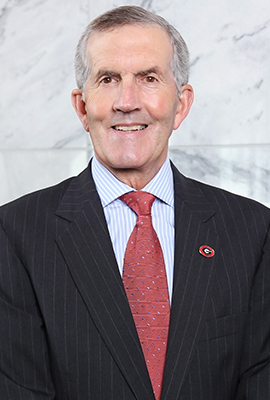 In addition, he was chair of the University Council's executive committee and served on the boards of the University of Georgia Foundation and the University of Georgia Alumni Association from 2014 to 2016. In 2015 he was appointed to the Oberlin College Board of Trustees, and in 2018 he was appointed to the NCAA's Infractions Appeals Committee. Prior to coming to Georgia, Shipley was dean and professor at the University of Kentucky College of Law (1993-98); dean, director of the Law Center and professor at the University of Mississippi School of Law (1990-93); and associate dean for administrative affairs and professor at the University of South Carolina School of Law (1989-90). He joined the faculty at the University of South Carolina School of Law in 1977 as a visiting assistant professor after practicing law with the firm Tillinghast, Collins & Graham for two years in Providence, R.I. Additionally, he has served as a visiting professor at William & Mary (1983-84) and Ohio State (1986-87). Shipley is a co-author of the casebook Copyright Law: Cases and Materials (with Sheldon Halpern and Howard Abram, 1992) and two editions of the treatise and practice manual South Carolina Administrative Law (2d ed., 1989). He also writes and speaks frequently on issues regarding copyright, intellectual property, administrative law and legal education at seminars and conferences in Georgia and across the country. Shipley is an active member of the ABA. He has chaired and served on many ABA accreditation inspections. Shipley earned his undergraduate degree in history with highest honors from Oberlin College and his law degree from the University of Chicago, where he was executive editor of The University of Chicago Law Review. Shipley enjoys working in his yard, trying to break 100 with consistency in golf, running, swimming and spending time with his family. All for Copyright Stand Up and Holler! Three Cheers for Star Athletica and the U.S. Supreme Court's Perceived and Imagined Separately Test, 36 Cardozo Arts & Ent. L.J. 149 (2018). A Transformative Use Taxonomy: Making Sense of the Transformative Use Standard, 63 Wayne L. Rev. 267 (2018). The Preliminary Injunction Standard in Diversity: A Typical Unguided Erie Choice, 50 Ga. L. Rev. 1169 (2017). Droit De Suite, Copyright’s First Sale Doctrine and Preemption of State Law, 39 Hastings Comm. & Ent. L.J. 1 (2017). Discouraging Frivolous Copyright Infringement Claims: Fee Shifting Under Rule 11 or 28 U.S.C. § 1927 as an Alternative to Awarding Attorney's Fees Under Section 505 of the Copyright Act, 24 J. Intell. Prop. L. 33 (2016). The Empty Promise of VARA: The Restrictive Application of a Narrow Statute, 83 Miss. L.J. 985 (2014). The Law Professor as Faculty Athletics Representative: Some Random Thoughts After Two Years, 2 Miss. Sports L. Rev. 287 (2013). The Chevron Two-Step in Georgia's Administrative Law, 46 Ga. L. Rev. 871 (2012). The Architectural Works Copyright Protection Act at Twenty: Has Full Protection Made a Difference? 18 J. Intell. Prop. L. 1 (2011). A Dangerous Undertaking Indeed: Juvenile Humor, Raunchy Jokes, Obscene Materials and Bad Taste in Copyright, 98 Ky. L.J. 517 (2010). Due Process Rights Before the EU Agencies: The Rights of Defense, 37 Ga. J. Int'l & Comp. L. 3 (2008). Congressional Authority Over Intellectual Property Policy After Eldred v. Ashcroft: Deference, Empty Limitations, and Risks to the Public Domain, 70 Alb. L. Rev. 1255 (2007). Thin But Not Anorexic: Copyright Protection for Compilations and Other Fact Works, 15 J. Intell. Prop. L. 92 (2007). Milner S. Ball: Proof That One Professor Can Make a Difference, 41 Ga. L. Rev. 753 (2007). The Status of Administrative Agencies Under the Georgia Constitution, 40 Ga. L. Rev. 1109 (2006). What Do Flexible Road Signs, Children's Clothes and the Allied Campaign in Europe During WWII Have in Common? : The Public Domain and the Supreme Court's Intellectual Property Jurisprudence, 13 U. Balt. J. Intell. Prop. L.J. 57 (2005). Introduction: From Autocracy to Democarcy: The Effort to Establish Market Democracies in Iraq and Afghanistan, 33 Ga. J. Int'l & Comp. L. 115 (2004). I Am Glad I Got to Know Him, 11 J. Intell. Prop. L. xvii (2003) (a tribute to the late L. Ray Patterson). Resigning as Dean: Stepping Down or Stepping Up?, 35 U. Tol. L. Rev. 189 (2003). Liability Issues Facing Online Businesses, 36 Ark. Law. 20 (2001). The Personal Side of a Deanship, 31 U. Tol. L. Rev. 739 (2000). Liability Issues Facing Online Businesses, 5 Ga. B.J. 48 (2000). A Law School Dean in Judge Keller's Court: My Service as a Circuit Court Juror, Fayette County B. News, Jan.-Feb. 1997, at 45. Property Rights in Cyberspace: Copyright Law in the Internet Era, 3 J. Agric. & Food Info. 3 (1996). Fourteen Tough Copyright Questions, 58 Miss. Libraries No. 1, at 16 (1994). Refusing to Rock the Boat: The Sears/Compco Preemption Doctrine Applied to Bonito Boats V. Thunder Craft, 25 Wake Forest L. Rev. 385 (1990). Three Strikes and They're Out at the Old Ball Game: Preemption of Performers' Rights of Publicity under the Copyright Act of 1976, 20 Ariz. St. L.J. 369 (1988). Copyright Law and Your Neighborhood Bar and Grill: Recent Developments in Performance Rights and the Section 110(5) Exemption, 29 Ariz. L. Rev. 475 (1987). Conflicts Between Copyright and the First Amendment after Harper & Row, Publishers V. Nation Enterprises, 1986 BYU L. Rev. 983 (1986). Copyright Protection for Architectural Works, 37 S.C. L. Rev. 393 (1986). Protecting Research: Copyright, Common-law Alternatives, and Federal Preemption, 63 N.C. L. Rev. 125 (1984) (with Jeffrey S. Hay). Equitable Distribution in Virginia, Colonial L., Spring 1984, at 16. Publicity Never Dies; it Just Fades Away: The Right of Publicity and Federal Preemption, 66 Cornell L. Rev. 673 (1981). Warrantless Administrative Inspections After Marshall v. Barlow's, Inc., 40 Ohio St. L.J. 81 (1979). Generic Trademarks, the FTC and the Lanham Act: Covering the Market with Formica, 20 Wm. & Mary L. Rev. 1 (1979). Copyright Cases and Materials. (West Pub. Co., 1992) (with Sheldon W. Halpern and Howard B. Abrams). South Carolina Administrative Law. 2nd ed. (South Carolina Bar, Continuing Legal Education Division, 1989). South Carolina Administrative Law. (Continuing Legal Education Committee of the South Carolina Bar, 1983). “Rulemaking” in South Carolina Administrative Practice and Procedure, 2nd ed. (South Carolina Bar CLE Division, 2008) (with Randolph Lowell). "Rulemaking” in South Carolina Administrative Practice and Procedure (South Carolina Bar CLE Division, 2004) (with Randolph Lowell). "Recent Developments in Trademarks and Franchising: McChicken Struts Its Stuff While Chicken Delight Cries Foul," in Recent Developments in Licensing. (Section of Patent, Trademark and Copyright Law, American Bar Association, 1981).